It’s quite obvious you can find yodel in Canada, being so close to the USA. So here is a post about Wilf Carter, also known as “Montana Slim” in the USA. 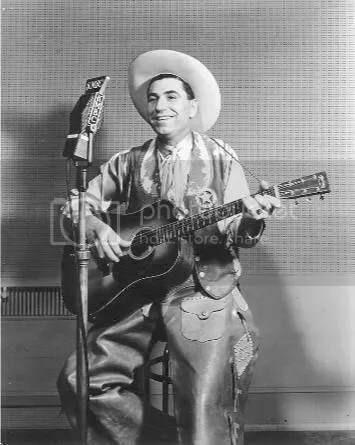 He began recording in 1933 for the Canadian office of RCA Victor who was looking for somebody who could maybe have the same succes as Jimmie Rodgers in the USA. 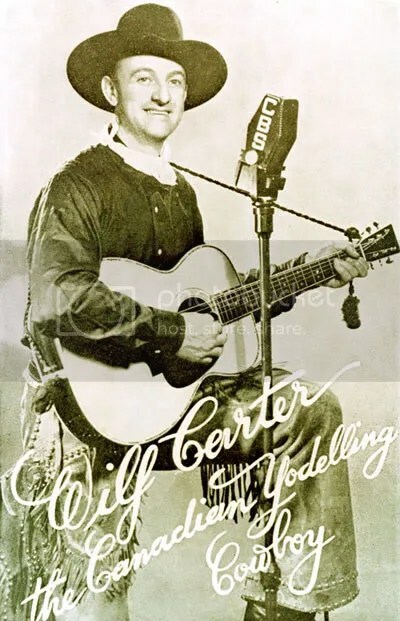 Wilf Carter’s yodeling wasn’t directly inspired by Rodgers, it was closer to the Swiss style. He became very popular, appearing on radio shows in Canada and the USA, touring with his own show, and recording more than 500 songs for different labels (RCA, Decca, Apex and Starday), his last being in 1988. He made one last tour in 1991, at age 86. He died a few years later in 1996. 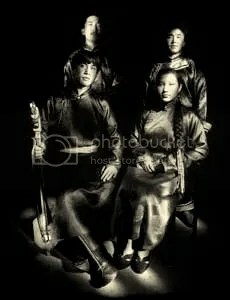 His simple style of singing and playing guitar have always attracted the listeners and the sentimental and naive music, the sunny optimism is a reflection of the singer himself. His first recorded song, My Swiss moonlight lullaby, was written during his trail rider days and had unique and wild yodeling. From 1934 is Little old log shack I always call my home, a typical Carter song, glorifying the happy cowboy life, with all the clichés: howling coyotes, moonlit nights, singing birds, horses and sweethearts. It wasn’t until 1952 that he recorded the first yodel he’d heard, Sleep, little one, sleep. From the Decca sessions in 1954 are this two yodel songs: My mountain high yodel song and The Alpine milkman. He is accompanied by a eight-men band including Chet Atkins. In 1956, he recorded Silver Bell Yodel, a quite traditional song but with echo in the yodel while The yodelin’ song is a bit more rock’n’roll, as an attempt to modernise a bit his style. From 1969 is a cover of a Jimmie Rodgers song, Cowhand’s last ride. For his discography, one label, as usual: Bear Family.